Das Jahr des Drachen, Wasserdrachen ! A Gallery of the Daruma Museum. is a rain-god dragon in Japanese mythology. According to Japanese Buddhist tradition, the priest Kūkai made Zennyo Ryūō appear in 824 CE during a famous rainmaking contest at the Kyoto Imperial Palace. The dragon name Zennyo Ryūō is written with Japanese zen 善 "good, goodness; virtuous", nyo 女 "woman; female" or nyo 如 "like; as if; be like; thus" (differentiated with the "mouth radical" 口), and ryūō 龍王 or 竜王 "dragon king". Zennyo is a common theme in Japanese art, usually depicted as a small dragon but sometimes as a human, either male or female, with a dragon's tail. The "female" representations could explain this variant character 女 (Visser 1913:162). Fowler (1997:155) cites Nishida Nagao 西田長男 that this 女 "woman" in Zennyo was an error for the original character 如. In Japanese Buddhist terminology, nyo 如 "like; thus" is used to translate Sanskrit words like nyorai 如来 "thus come" for tathāgata. Compare shinzennyo 近善女 "near goodness female" translating upāsikā "female disciple; female devotee". Zennyo 善如 was also the name of a Jodo Shinshu priest (1333-1389 CE) who was a grandson of Kakunyo and the fourth chief priest of the Hongan-ji. Some legends give the name of Zennyo as Zentatsu 善達 "goodness penetration" with tatsu 達 "penetrate; arrive at; reach; realize" instead of nyo. Zennyo or Zentatsu 善達 supposedly lived in the Ryūketsu 龍穴 "Dragon Hole/Cave" on Murōyama 室生山 "Mount Murō" in Nara Prefecture, which was an ancient locale of Japanese dragon worship and rainmaking ceremonies. 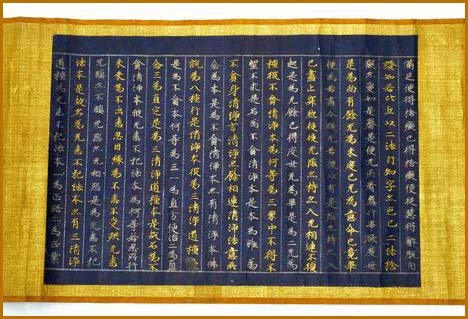 The oldest historical record is the 937 CE Ben’ichizan nenbun dosha sōjō 宀一山年分度者奏上 "Mount Murō Annual Report of Ordained Monks". It states that in 778 CE five Buddhist monks went to the mountain and ceremonially prayed for the health of future Emperor Kammu (r. 781-806), who later established the Murō-ji Temple in appreciation. This text also states that in 781 CE, (Fowler 1997:147), "a Dragon King (龍王) who had been residing at this site vowed to protect the country and particularly the temple complex. For this gesture the dragon king was honored with a courtly rank, as was commonly offered to deities." The best-known appearance of Zennyo was during an 824 CE Buddhist rainmaking competition at the Shinsen'en or Shinzen'en 神泉苑 "Divine Spring Garden" in Kyoto. The scholar priest Kūkai or Kōbō-Daishi (774-835 CE), founder of Shingon "True Word" Buddhism, and his rival priest Shubin 守敏 held a rain-sutra recitation contest. Visser (1913:25) describes the Mahamegha sutra, Japanese Daiunkyō 大雲經 "Great Cloud Sutra" or Daiun Seiukyō 大雲請雨經 "Great Cloud Praying for Rain Sutra", as the "most important of the sūtras, recited by the Northern Buddhists for causing rain in times of drought". In 823 CE, Emperor Saga (r. 809-823) put Kūkai in charge of the Tō-ji "East Temple" and Shubin in charge of the Sai-ji "West Temple". In the next year, a 3-month drought occurred and Emperor Junna (r. 823-833) ordered Kūkai and Shubin to perform rainmaking ceremonies. Zennyo is worshipped at the Zennyo Ryūō-sha 善女竜王社 Shinto shrine on an island in the Shinsen'en, reached by crossing the Hōsei-bashi 法成橋 "Dharma Completion Bridge". Some versions of this Kūkai story record Zennyo coming from Mount Murō and others from Lake Anavatapta, which is at the center of the world in Buddhist cosmology. Anavatapta was also the name of a Nāga "snake; dragon" king, a Nagaraja "Dragon King", who lived in this namesake lake. 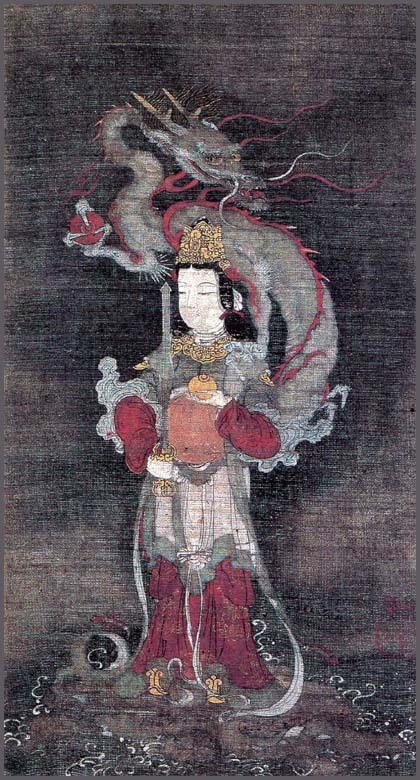 According to Mahayana tradition (Visser 1913:4), Anavatapta was one of the Hachi-ryūō 八龍王 "8 Dragon Kings" that first heard the Buddha preach the Lotus Sutra. Various early Japanese texts record legends about Kūkai invoking the rain-dragon Zennyo. 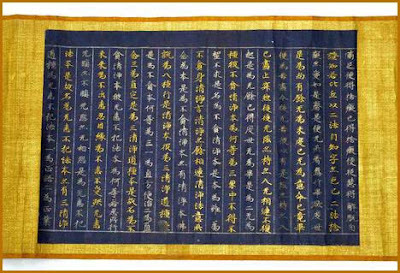 The 835 CE Goyuigō 御遺告, which records Kūkai's last words, first describes Zennyo (Fowler 1997:154) as, "a golden snake measuring eight sun 寸 (approx. 24 cm) riding on the head of a dragon measuring nine shaku 尺 (approx. 2.7 m). This description is repeated in several other literary sources." The early 12th-century Konjaku Monogatarishū "Collection of Tales About Times Now Past" gives this account. The ca. 1372 CE Taiheiki "Record of the Great Peace" expands the rainmaking story and says Shubin became jealous of Kūkai's successes after returning from China in 806 CE. He magically caused the 824 drought by using tantras to capture "all the dragon-gods of the inner and outer seas". Kūkai constructed a straw dragon effigy and declared he would transform it into a dragon king who would return to Lake Anavatapta, thus causing the original rain-dragon to stay in the park. He instructed his Shingon priests to pray to Zennyo whenever Japan suffered from droughts. Fowler (1997:157-159) contrasts the present-day autumn festival at Ryūketsu Shrine, where abstract dragons are fashioned out of straw cords and maple leaves, but are no longer associated with rain prayers to Zennyo.
. Join the friends on facebook ! .
. Dragon Shrines of Japan .
! Join us - facebook !